See Pictures of What's Up at Coosh's? a. Thanks, again, now I do. What type of food does Coosh's serve? Did you know that you can get authentic beignets Saturday mornings from 9a til noon at Coosh's? a. Cool, I love those little made fresh cajun donuts. 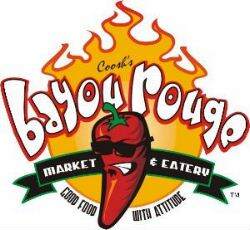 Coosh's Bayou Rouge is also a market that you can order_________from to take home for any occaision. What types of platters does Coosh's specialize in for catering your event or party? f. Popcorn Chicken g. Mini Crawfish Pies h. Trays of Shrimp, Vegetables, Cheese & Meat,or Fruit i. Chocolate Brownies, Cookies, Mini Pecan Pies, & White Chocolate Bread Pudding j. It's gotta done be all dis, don't it?